We've spent a lot of time dissecting boutique gaming desktops, but there are entire other classes of hardware that we only rarely put through their paces. Today that changes with the first in what we hope will be many reviews of workstation-class desktop machines, and we're kicking things off with a mid-range workstation courtesy of Dell: the new Precision T1600. Designed for low power and high performance and equipped with an entry-level workstation graphics card from NVIDIA, we'll run it through our usual desktop gauntlet along with a couple of extra tests and see what Dell brings to the table. Dell's Precision T1600 is pretty unassuming, but workstation desktops are exactly that: they're work horses, not show ponies. But inside this Micro-ATX mid tower is a decent amount of enterprise-grade hardware. 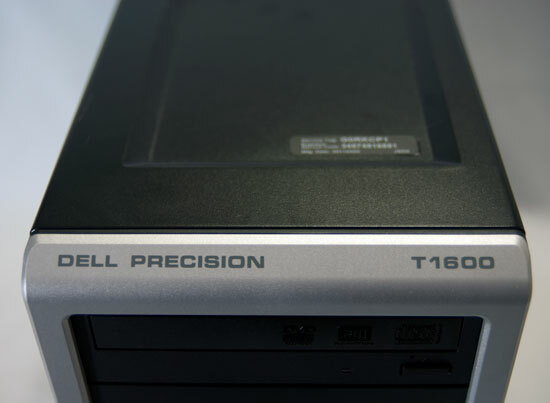 Dell has made big strides with their new Precision T1600 series. There's the usual generational hardware refresh: the T1600 sports Sandy Bridge-based Intel Xeon processors along with a GF106-based NVIDIA Quadro graphics card. But Dell (not at all unlike HP) has also added a smattering of ISV certifications to this tower, including Autodesk's AutoCAD, Maya, and 3Ds Max. Strangely there's no certification from Adobe, whose production suite would likely benefit substantially from a system like this one. In fact, the NVIDIA Quadro 2000 card in our review unit is one of the frustratingly few cards actually certified for Premiere Pro CS5's Mercury Playback Engine (although anyone with an NVIDIA graphics card, 1GB of video memory, and access to Google can get MPE to work). The review unit Dell shipped us is fairly beefy compared to its base spec, upgrading to the second-fastest processor they have available (the E3-1280 is 100MHz and $600 more) and the absolute best graphics card the tower ships with. If you haven't ever checked out enterprise-class hardware before, a couple of things here are going to be pretty interesting to you. First is the Sandy Bridge-based Intel Xeon E3-1270. This chip is ostensibly an enterprise version of the desktop Core i7-2600, running at a nominal 3.4GHz and capable of turbo-ing up to 3.8GHz, but in this instance the integrated graphics have been disabled completely: if you take the Quadro out of the tower, there just won't be any video output. The flipside is that losing the GPU knocks the chip's TDP down to just 80 watts. The C206 chipset it's strapped to is also the server/workstation equivalent of the desktop H67. There's also the NVIDIA Quadro 2000, a single-slot video card based off of NVIDIA's GF106 chip. It sports a full 192 CUDA cores and 1GB of GDDR5 strapped to a 128-bit memory bus, but clocks have been significantly curbed to hit the card's 62-watt TDP. The desktop GeForce GTS 450 (built on the same chip) has a nominal core clock of 783MHz (1566MHz on the shaders), while the Quadro 2000 runs at just 625MHz on the core and 1250MHz on the shaders. The GDDR5's memory speed has taken a massive hit, too, going from 3.6GHz down to just 2.6GHz. That said, there are reasons: the Quadro 2000 can be cooled using a single slot, it runs quietly, and more importantly it's optimized for workstation tasks the GTS 450 isn't designed for. It's also interesting to see a RAID 0 setup come through here, something that's been a bit rarefied. Some enthusiasts swear by RAID 0 (yours truly, for example) while others don't see the point. While this striped RAID is still running off of mechanical drives, it at least provides a tangible boost over running a single disk. That said, it still can't really replace the performance of an SSD, but at least it can beat the capacity for a lot cheaper. The rest of the system is going to seem fairly uninspiring, but try to remember: this is Dell's entry-level workstation. It doesn't need the biggest and best, it just needs to provide a sensible balance of price and performance for the intended tasks. I'll go ahead and gripe about the power supply, though: 265 watts isn't an issue for a computer like this, but the stated 65% minimum efficiency is frankly dismal. Even under peak load that wattage isn't liable to be a huge problem, but in a business environment every watt counts and that only becomes more and more important as the number of systems deployed increases. Dell is willing to offer an 85% efficient 320 watt power supply as a $50 upgrade, but frankly that seems miserly, especially when Antec sells a 380 watt, 80 Plus Bronze certified power supply for $45. That may be an off-the-shelf consumer product, but the point stands. Dell should simply eliminate the 265-watt PSU option and use the 320-watt model as the default. I'd be interested in seeing tests of pro level graphics cards (Quadro & FireGL) in Solidworks and Autocad. Am I the only one that has never heard of the E3 series Xeon chips? Are they a replacement for the 5600 series, or where do they slot in compared to previous gen Xeons? And yes, Dell RAm is laughably expensive. They wanted $430 to go from 4GB to 8GB in my M4500. I bought 8GB from Crucial instead for $97. They also have crazy prices for SSD's. I was surprised how basic the heatsink is on this compared to an Optiplex 980 which is a mere business class desktop and not a workstation. That Optiplex has a much larger heatsink and uses a larger fan so potentially could run even quieter.